Great condo, perfect location, staff is very helpful. Have never had a bad experience always clean! Quiet, peaceful location with so many things to do. Thank you for a great weekend. We plan to be back next year. Thank you so much! We have stayed in this home multiple times so I thought it was time to write a review! This home is always super clean and well stocked. Seems like every time we come there is a cool new piece of artwork on the walls or an improvement. The location is great no matter what the season. We have visited in the summer, winter, and the fall. In the summer, this place is only a few blocks from the best park in town for the kids. In the winter, it is only a few blocks from the free shuttle which takes you to the slopes. Of course it is an easy walk to downtown and the restaurants. (Crested Butte is only 10 blocks long so it is all walkable) The hot tub is great and the two living rooms means we can separate from the kids and relax! Thanks for another great vacation! We will be back! We had a great stay at this wonderful Mt. Crested Butte home! It's a modern house with all the charm of a mountain getaway. It's conveniently located within walking distance to hiking or ski lifts, but with the shuttle stop so close, it's just as easy to hop on the shuttle. We can't wait to go back! We booked this home for spring break and loved it! The home was exceptionally clean and well stocked. There were 8 of us and the home is laid out very well. The views are to die for and the town is so cute with all of the historical buildings. There are so many restaurant choices here it's hard to choose. We've already made plans to come back this summer. Thanks for a wonderful time! 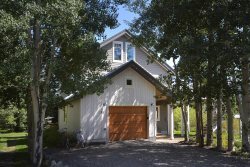 Great location between the town of CB and the ski area made it super convenient to get to the slopes or town. We didn't need a car. The rooms are spacious with a great main area to eat, cook and hang out with the family. The deck offered views of the surrounding mountains. Would definitely return. Thank you so very much for sharing your beautiful home with us again. This is our second time in your home and it is just perfect for our family. Thanks again for a fantastic time with our family! We came for the Wildflower Festival and found this home to exceed our expectations! It is conveniently located to numerous trails (for hiking, biking, running, etc.) and to the FREE shuttle. The house is very clean and well maintained. I would highly recommend this home! I have stayed here many times and I never want to leave. A great place to unwind, relax, enjoy the views or use as a base for adventure. Whether it's summer, fall, or winter, running and riding trails are right out the door. You can sit on the porch and watch the sunrise or set while enjoying a coffee or glass of wine. The appliances are top notch making it easy to cook and clean, leaving more time for enjoying Crested Butte. Sleep comes easy even at this altitude as it is quiet and cool every evening. The layout is perfect for family or a gathering of friends - enough space to be together and plenty of nooks to find time alone if needed. If it's winter, skiing is right out the door, just a walk down the street and in the summer you can watch fireworks just a few blocks away or catch the shuttle to town and explore, saving you from the always tricky parking search downtown. One the best places to stay in CB, hands down. Attempts to describe in detail how wonderful this place is will fail! So I won't even try! Thank you for letting me enjoy it! The views are jaw dropping! Enough said. We were only able to stay a few days, but we fell in love with this house. It was very clean and well kept. It was beautifully decorated and very roomy. It would easily sleep 10 people and would be great for two families to share. There were plenty of towels and supplies such as toilet paper, paper towels and trash bags which is very different from other homes or condos we have rented. The kitchen had anything you would need to cook a full meal (other than the groceries of course). It was definitely worth the price and exceeded our expectations. We will definitely consider renting it again during future visits to CB.